Skydoc aerostatic balloons. Skydoc is an American manufacturer of aerostatic balloons. They produce both single and double ply aerostatic balloons, along with the associated transportation equipment. Of special interest from this company is the EDD or emergency deflation device that can be used to bring down a balloon that has escaped it’s mooring. This has potential application in the untethered balloon sphere. 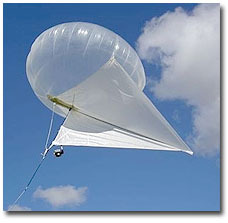 Aerostat is made of Urethane. depending on temperature swings and aerostat pressure. Net lift is at zero wind speed. Maximum lift is at 90 mph wind speed. Aerostat’s smaller than Model #15 are not stable in high winds. Net lift is at Sea Level. Subtract 15 per cent at 5000 feet. Note: SkyDoc™ aerostat Model numbers are stated as Filled Diameter and Filled Height. SkyDoc™ filled aerostat sizes are stated with normal pressure. Welder’s grade helium is required. Tether weight must be added to payload weight to calculate total lift. Note: Altitude, ambient temperature, attack angle, payload, wind conditions, air density, and other factors determine the final lifting force available. Radio Controlled Emergency Deflation Valve and Burn Units are available. Helikite, the best of balloons and kites. 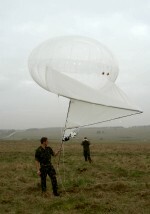 Helikite aerostats are a patented combination of a helium balloon and kite. UAV’s blimps and kites. Normal balloons are pushed down by wind, whereas Helikite aerostats are actually pushed up by it. Normal kites fall down in no wind whereas helium filled Helikites are lighter-than-air and fly in still airs. Normal tethered blimps have to be brought down in bad weather, whereas the Helikite aerostat I stable in high winds. Helikites can fly to great heights in no wind and then catch any breezes that may exist at altitude. They can then use that breeze to maximise lift. Helikites are for varied applications including: Aerial Photograpy & Video, Surveilance, Ad Hoc Radio, Radio Relay, Weather Research, Lifting Equipment, Surveillance, Amateur Radio, Publicity, Agriculture, etc.